Nap time! Put on your nightie, grab your blankie, and let's take a nap! Get your sleepyhead ready with this PDF pattern from Love U Bunches! This cute little raglan sleeve nightie is made from t-shirt or light weight knit fabric. The nightie has an overlapping hook and loop tape back closure and fold over elastic trim. The binding on the blankie is made with satin or grosgrain ribbon. Are you getting sleepy yet? 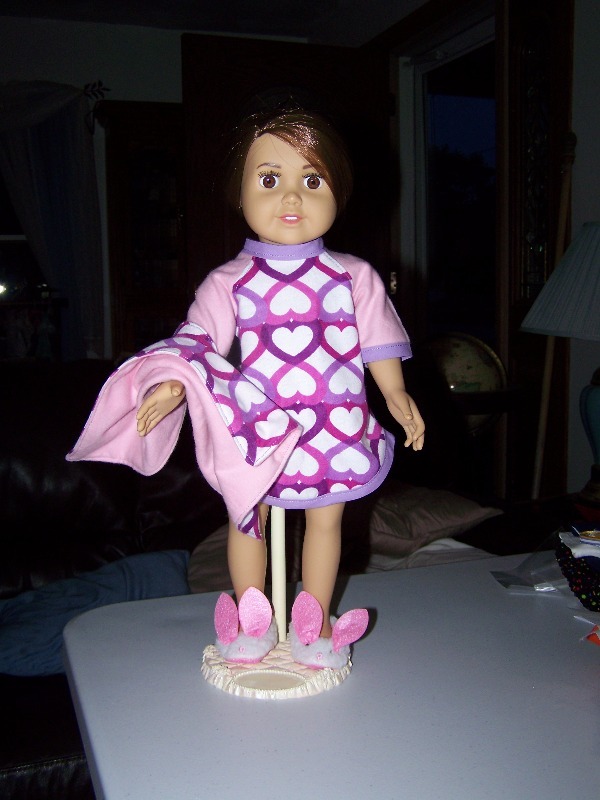 This pattern fits 15" and 18" dolls such as Bitty Baby® and American Girl®. The sleep shirt was easy and quick to sew. This is such a cute pattern! It works up really quickly and the results are adorable! I used flannel for the front and back pieces and a knit for the arm pieces. It also fits the Bitty Baby and Bitty Twin perfectly with no tweaks! !